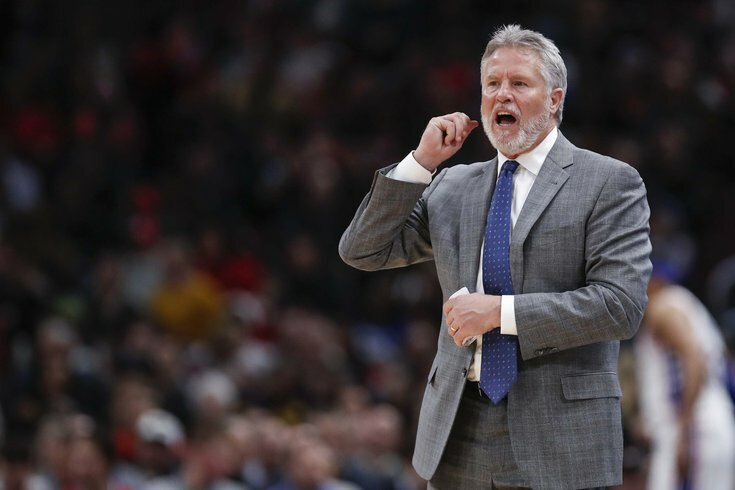 Philadelphia 76ers head coach Brett Brown directs his team against the Chicago Bulls during the second half at United Center. Whenever a home favorite goes down in ugly fashion in Game 1, the natural instinct on the outside is to call for burning everything to the ground. Throw out the gameplan, start from scratch, trade the entire team if you have to. The Sixers got their butts handed to them in Game 1 by the Brooklyn Nets, so a lot of people will enter Game 2 expecting dramatic changes. Don't count on that. The tone at Sunday's practice leading into Game 2 was not one of panic, and the Sixers seem to believe small tweaks are the way to get back on track. "If you go to some of the problems we had defensively, I think that the plan, the basics of the plan are solid," Brett Brown said on Sunday. "And that's always your fear. If you choose the wrong path at the start of a series, and you feel like [it's wrong] after Game 1, well you do what you gotta do and make an adjustment, but we don't feel anything in regards to overreacting to the overarching plan." Those of you who were frustrated by D'Angelo Russell's mid-range assault in the second half will not be pleased to hear that. The Sixers are still going to concede a shot that one of Brooklyn's best players likes to take? That seems a little unsavory on the surface. This will sound silly, but if D'Angelo Russell goes for 50 and the Sixers simply defend better everywhere else, it really doesn't matter how many mid-range shots Brooklyn's guard makes. There were times when JJ Redick was getting blown off of the floor, but this wasn't one of them. He's guiding Russell in a direction the Sixers can live with and Embiid is in position to help on Russell and stop Jarrett Allen from getting an easy look at the rim. The play breaks down because Simmons helps away from one of the best shooters in the NBA and flails around like the plastic bag in American Beauty. If you're looking for something to fix, plays like those can be tightened up immediately without any tweaking of the scheme. That's about mental sharpness above all else. Personnel is arguably the bigger concern heading into Game 2. Brown's decision to play Jonathon Simmons in the backup wing minutes hurt Philadelphia big time, with the other Simmons offering no floor spacing or much resistance on defense. There is an argument, however, that the Sixers may want to keep him in the rotation at the cost of a Sixers mainstay. With Butler taking charge of the second unit, T.J. McConnell's usefulness on the floor dwindles big time. While Brown has made the claim that he's one of the Sixers' best pick-and-roll defenders, the results didn't show that Saturday (nor have they for some time). D'Angelo Russell shot 57 percent from the field when guarded by McConnell in Game 1, and the Nets scored over a point per possession on the 18 possessions where he was responsible for Russell. That being the case, if you're going to try Simmons in a backup role, I would argue McConnell should drop from the rotation to put Simmons and Zhaire Smith on the floor. Those guys are at least willing shooters from deep, and athletically they're much better equipped to chase Brooklyn's guards around screens. Everyone would feel better if the Sixers had a rotation with enough depth to easily solve problems in real time, and this is not a switch anyone should feel over the moon about. But with Brooklyn winning so many one-on-one battles, it only makes sense to look at one-on-one changes. This is not to say there won't be any tweaks schematically for Philadelphia after a Game 1 loss. The defeat was about more than just a few miscues from Simmons, and the Nets did an excellent job of taking the Sixers' shooters out of the game. Brooklyn was a league-average defense this season, but they finished the year near the top in three-point defense, an area the Sixers themselves took great pride in. Brown credited Brooklyn for their hard work on Saturday, but he expressed confidence in the team's shooters to turn things around. "I think offensively when you look at what we shot from the three-point line, when you look at the missed free throws we left on the table, statistically those things come to mind," Brown said. "We got some looks that we would want again, and we'd hope to see a better result." That much may be true, but Brooklyn spent a lot of energy trying to prevent Philadelphia's shooters from ever getting to the three-point line to begin with. Aggressive top locking is something we've seen teams use against JJ Redick before (most recently in the last Milwaukee game) and Brooklyn employed it to great effect on Saturday. The natural counter to this is to hit your opponent with backdoor cuts, and the Sixers had a little bit of success doing that when Brooklyn's strategy became clear; Butler scored on a lob from Boban Marjanovic following a timeout in the third quarter. But this is another area where the Sixers are hurt by their non-shooters. Top locking is meant to prevent three-point looks, but it also means the defense is designed to anticipate the Sixers countering with more cuts toward the rim. Brooklyn can send help away from guys like Simmons or T.J. McConnell to prevent easy passes on those cuts, and now you've wasted a lot of time to accomplish very little. Another question high atop the priority list for the Sixers heading into Monday night's game: how do they respond to Brooklyn's small ball? While we may not see as much of it if Jarrett Allen stays out of foul trouble, the Nets showed no fear of Philadelphia's size in Game 1, putting Jared Dudley on the floor at center with either of Joel Embiid or Boban Marjanovic on the floor. That creates the exact problem the Sixers want to avoid on defense, with their rim protector having to defend out to the three-point line and chase around smaller players. The Sixers don't need to reinvent the wheel in Game 2. But they do need to show up prepared for what Brooklyn will throw at them to avoid creating a 2-0 hole for themselves.